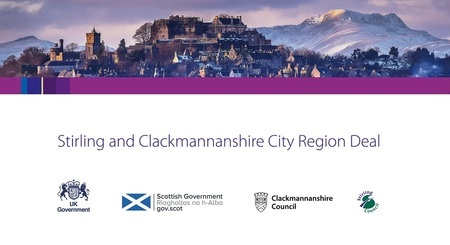 Work to progress and deliver the Stirling and Clackmannanshire City Region Deal continued this week following a meeting of the recently established Joint Committee. Elected members from both local authorities met with regional business representatives and senior officers from Stirling and Clacks at Stirling Council’s headquarters to discuss the work which lies ahead to deliver the £90m investment package from both the UK and Scottish Government. Transport, Connectivity and Low Carbon. The £90.2million pledge outlined by both the UK and Scottish Governments in the Heads of Terms agreement signing was followed up by a further pledge of £5million from the Scottish Government for projects in Kildean and Callander. Partners from across Stirling and Clackmannanshire will then supplement the Government commitments by investing additional sums in excess of £100m over the term of the deal. The City Region Deal Joint Committee was established in December 2018 to scrutinise and provide oversight of the progress towards delivery of the Government investment. Tuesday’s meeting was its third sitting since formation, and gave members a chance to assess the status of business cases being developed to allow the drawdown of the finances pledged by both Governments. Stirling Council Leader, Cllr Scott Farmer said: “Today’s meeting provided an excellent opportunity to continue our discussions on this historic Deal. “The funding and investment announced in May last year was a landmark moment for us all and committed joint government investment of £95.2m across the city region over the next 15 years. The City Region Deal Joint Committee consists of three elected members from Stirling, three from Clackmannanshire and two representatives of the local business community.